Are there any stocks that pay monthly dividends? I'm keen to build my dividend income, but would also like it to be regular, a bit like a paycheck. Well, there are a few companies which pay dividends monthly, but they're a bit of a rarity. Probably the most famous example is Realty Income Corporation. This is a real estate company that uses collected rents from commercial properties to pay the monthly dividends. They proudly state that they have now paid a dividend for 554 consecutive months with 76 consecutive quarterly increases. The current yield of this is 3.4% (as of June 30, 2016). One of the most comforting things about working in a salaried job is the monthly pay check. You know how much it will be and what day it will arrive. Dividends can be different. You don't know exactly how much you will get paid and you don't know always know when. Also, they tend to show up quarterly or semi-annually, rather than monthly. 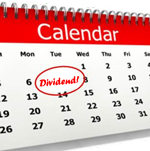 I don't think monthly dividends should be your primary goal. It is more important to pick high quality companies. I advise focusing on companies that have sustainable high returns on equity, pricing power, low or no debt, owner friendly management, and reasonable valuations. When the dividends are paid should, at best, be a minor consideration. That said, there is some comfort to monthly dividends. If you are retired and don't have a salary for work then it is likely you have monthly obligations and you would like to match those obligations with monthly income. Also monthly income, can help you come up with the cash reasonably quickly to make purchases if the market declines and shows better value. You may have heard of a "bond ladder" where you build a portfolio of bonds that mature at certain dates so can provide you payments on set dates. When building a portfolio of stocks, you may want to consider a "dividend ladder" which will provide expected dividends in certain months therefore providing you with monthly dividends. As you can see from above, you can build very regular payments into your portfolio by picking a good basket of stocks. We re-iterate that we don't believe you should focus on when you get paid but we do recommend some diversification in your portfolio and this should help you if you would like a monthly income from dividends.